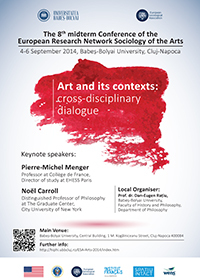 The European Research Network Sociology of the Arts held its 8th midterm conference at Cluj / Romania from September 4-6, 2014. I had the honor to present a paper on the current state and the outlook of research conducted within the GiantSteps research project, focusing on prospects and problems of so-called “musical expert agents” in creative processes. The paper discusses a situation where the availability of large amounts of data on artistic work facilitates new approaches in composition and sound creation. What are the expectations towards these new possibilities? Are artists looking forward to algorithmic “agents”, or will they disable them immediately? This entry was posted in Articles, Conferences, Science, sociology, systems theory on September 8, 2014 by fgrote.